Tough girl meets classy lady in the 'Gretta' Clutch from Heather Hawkins. 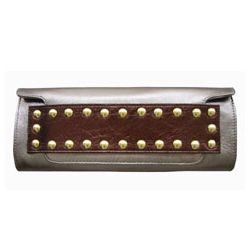 A basic leather flap clutch is toughened up with a contrasting gold–studded leather band. Take it to the office and show you mean business; wear it out at night to stand out from the crowd. The Gretta Clutch comes in several startling color combos, like turquoise with teal, and light pink with fuschia, but the pewter–chocolate number will surely get you noticed. In a great way.